Included in the Blu-ray™ Combo Pack is an all-new UltraViolet™ copy of the film. UltraViolet™ is the revolutionary new way to collect movies and TV shows, put them in the cloud and stream instantly to computers, tablets and smart phones and soon, and download to devices too. The Tower Heist Combo Pack also includes a DVD and Digital Copy of the film which is compatible with iTunes®, iPad®, iPhone®, iPod™ touch, Android or other retail partners. So now, enjoy the movies and TV shows anytime, anywhere! The Blu-ray™ also includes Universal’s Second Screen—a technology that enhances the viewing experience with simultaneously control and interaction with the film and bonus material on a WiFi-connected tablet or computer as the movie plays on the television screen. The new Flick View Feature will allow interaction even more with the movie and be able to move content from tablet to TV screen. There are two Hilarious Alternate Endings & Exclusive Bonus Features which should be good fun. 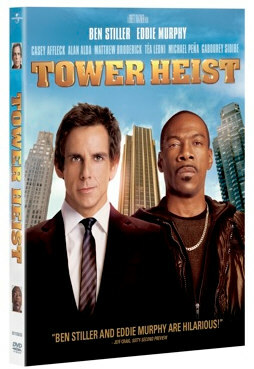 Comments for TOWER HEIST on Blu-ray & DVD on Feb. 21, 2012 are now closed.